Some of the floorboards in my basement studio had woodworm and needed replacing. I had been using the basement as a photographic darkroom and studio; so I pushed my equipment to one end and pulled up the first board. Underneath were timbers above an earth floor. The earth looked loose and smelt damp. But the room always did smell damp, despite having a large window looking out into the area where two coal cellars displayed their dark interiors. It was when I got hold of the next board to pull up that I had my first warning. I had a distinct urge to take my hand away in case I touched something I didn’t like. As a child I had killed a mouse once during harvesting. I had put it in my pocket and forgotten it in the excitement of chasing rabbits running out of the wheat. Days later I wore the jacket again and put my hand in the pocket where the dead mouse was, cold and soft. It was a great shock, and as I held the board my hand wanted to withdraw in case I did the same thing. I thought it was a childhood fear of the unknown I was touching; waited until my heart slowed down and pulled the board up. There was nothing to see except earth. As the other boards came up I noticed an area where the joists were further apart. Quite a big area was thus left uncovered. By that time I had taken up all the rotten boards and stood wondering what to do with them. They were too awkward to put in the dustbin. London dustmen seemed to me to be more outspoken than dustmen in general, so I decided to burn the wood. I didn’t need much of an excuse. I love fires, and the basement had a good sized grate. The daylight was fading and an evening chill setting in. I got a good blaze going and enjoyed the warmth and feeding the flames. As the light from the fire and small bulb took over from the daylight that filtered through the area window, the earth beneath the joists took on a different appearance. It was dark, mysterious, and, I felt, very deep. Without consciously admitting this feeling I avoided walking across the joists as I collected more wood for the fire. Also, the open area of earth drew my attention. I must have stared several times before I realised what attracted me. The light bulb, being to one side of the gap, was casting a slight shadow on the surface of the bare earth. What I had missed seeing at first was that the unevenness of the earth was not random. A curving, hardly distinguishable mound was exposed by the angle of the light. It reminded me of the cartoons in which a mole is shown digging into the ground, and to show its whereabouts, a line of raised earth appears. Something, I thought, had dug a hole under our house. What sort of creature in Bloomsbury, London, would dig under a house? The bore of the hole appeared large; about three inches across. Picking up a piece of nearby wood, snapped from a plank, I gently poked the earth. I wanted to carefully look into whatever hole was there. Have you ever stepped down a step you thought was there, but wasn’t? The wood went into the earth then stopped. I had thought it was going to penetrate a cavity. Instead I sensed something firm but slightly yielding. After that I can’t account for my movements. I can only describe the images indelibly imprinted in my emotion. No, that’s not right. It feels to me they were carved into my body. The earth writhed and surged. Suddenly it was no longer earth but a great serpent, as long as several men, powerful, devastating. But it was white. The sort of white some men’s flesh is when never exposed to the sun and they are dying. And that creature lifted out of the earth and looked at me. Such was my state of mind that the eyes may have considered me for hours, cocked and frozen, or perhaps a split second. I don’t know. But I am certain there was intelligence there, of a sort I had never encountered before. It was ancient and impersonal. I had the impression of it being more than it’s body, as if it were a power, the power of impersonal nature itself which can create the miracle of a new-born baby, then eat it alive with a strange disease, or crush it with an earthquake. It was awe-full. I was impressed. I must have cried out when it moved again. I can’t remember doing so, but apparently people two houses down the steet heard me. I find that I can’t tell you this straight out. I’m not trying to apologise or make excuses for myself. I know from hard experience that people begin to cut off the conversation when I get to this point. I know it is difficult to believe, but I need to be able to explain the whole story. When it moved I saw the body of a woman. She was naked and appeared dead. In some way that I cannot be clear about, she was bound to that beast; they were one. I know this sounds contradictory, but I knew she could direct it, and she looked at me. Her eyes were alive. It was then I was overwhelmed with fear. I was paralysed by the feeling I had stirred up something which was evil, and I was now known to it and was a marked man. The last image etched into me is of both of them plunging into the earth and disappearing. A rational explanation has been found for that since, but at the time it was another block of unbelievable experience for me to contend with. Eventually Su and my parents called the doctor. I couldn’t stop trying to tell them what I had seen. I must have sounded crazy because at that time I couldn’t get my story laid out slowly and consecutively. I remember saying to my father, “But dad, I saw the bloody thing dive into the floor with the dead woman.” I could see he was frightened. Not of what I was describing, but because I was saying it. I even insisted they closed the shop early and go into the basement with me. When we got there I really didn’t know what to say. There were a few marks in the earth, but nothing to tell a story with. But when I poked the spot where I had seen the creature and woman disappear, the earth was waterlogged. With the stick I discovered what felt like a square well of bricks. Dad said it must be an old sewer. I think my family decided the doctor was the lesser of three evils. After finding the well I really lit up again, and tried to get to the phone to contact one of the daily newspapers. The talk of possible murder must have put the idea of the police into Su’s mind at least. When I questioned them about this since they just say they were worried out of their wits, and wanted to help me. Doctor Wyse is quite a big man. He looked athletic without being obviously muscular. He has never treated me as if I was a fool who knew nothing about the human body, or as someone incapable of making their own intelligent decisions. Because he never patronised me I was always able to talk to him easily and feel satisfied afterwards. Su hadn’t told me he was coming, so when the door bell rang and Su let him into our kitchen the whole event of the snake appeared to replay and I saw it from another point of view. A friend of mine, Geoff, unmarried and living with his sister and brother, one day had, as his sister put it, “suddenly started rambling on.” Then he had run around the house saying how many years they had wasted by not loving each other. When his sister shut herself in her bedroom, Geoff banged on the door shouting that’s what they had always done, shut themselves away from love. The doctor had called and given Geoff an injection. The injections were given each day until Geoff became normal again. Personally, I thought he had a point. The house reeked of unsatisfied desire and sexual tension. But the thought of injections made me suddenly very careful. There are even worse things than injections done to people who don’t conform to what is expected of them by the group they live amidst. I didn’t see any need to put myself in a straight jacket no matter what I had seen. Better be wise before the event. I smiled. I know a little bit about psychology. That he didn’t say I had seen anything made me aware how careful he was being not to have his own preconceptions. I relaxed some of the tension I had felt when I saw him walk in, and I noticed he relaxed too. At that point my parents and Su left us, and I described what had happened. His opening sentence helped me to find a standpoint from which to meet him. So I told him that I felt it difficult not to believe I had seen the things I was describing. It was impossible to maintain my calmness though. As I described the central part of my story, I couldn’t keep my body still. I felt flushed and excited, and I noticed Wyse looking at my hands. I realised I was gripping the chair. By the time I had finished I felt it almost impossible to sit still. The tension had begun to drop from me again. I thought about what he had said, realising he would not have spoken about my family’s doubts if he himself really believed them. By treating me as if I was rational enough to look at my own problems, he was in fact bringing me into a steadier relationship with what had happened. When I looked at him and said, “Thanks”, he seemed to understand what I meant and nodded his head. Seeing that, and seeing he was on my side; or at least not trying to trap me, I felt trusting enough-toward him to sit without talking for a while to consider his questions. Call me Andrew” he interrupted. He crossed his legs and leaned toward me, chin on one hand. “I don’t feel sceptical about what you’ve told me,” he said. I led the way. From the front of our house, at the side of the shop, a passage connects the front door with the back. The kitchen is off this on one side, and the stairs to the basement on the other. The stairs creaked as we went down. I felt a bit apprehensive as I opened the door, but the room was chill and empty of atmosphere. It looked a mess with the floorboards up. I began to feel detached from what had happened, and in fact had an urge to nail down the new boards I had ready. Maybe it was a reaction to the turmoil I had been through, and which I now wanted to push away into the past; nail it into forgetfulness under the planks. But it would always seem strange photographing people down here standing above whatever it was. I must have wandered off a long way into my thoughts because I heard Andrew’s voice saying, “Bob, have you got a pole?” It was said as if he had already asked me and was trying again. “What were you thinking about” he asked when he saw I had heard him. It was obvious really because the earth was waterlogged. I poked the rod into the water about a foot and banged the brass end against the four walls so we could hear it click. Then I slowly pushed it deeper, occasionally banging it against the sides as well as I could to hear if the bricks continued. It felt like they did. Altogether the rods were about ten feet long. At about seven feet I hit resistance. It felt like mud. I began to pull the pole up to push it down hard. That puzzled me because it was difficult to pull up, as if I was pulling up a weight. Andrew must have seen my expression change. “What is it?” he asked. I was just about to hand him the pole when I felt it quiver. I paused and pushed it down slightly. Suddenly it was torn from my grasp, almost wrenching me down the hole. I managed to let go when I was arm deep in the muck. I screamed and with convulsive movement, catapulted away from the hole. I looked at him with my mouth open for a while before I realised he was serious, and my anger broke. “For God’s sake man, I didn’t push, I was pulled. Didn’t you see, I was nearly pulled down the bloody hole. There’s something down there I tell you, and all you can do is ask my why I pushed the sodding stick.” I got up off the floor and stamped around the room a bit. I wanted to kick something, preferably Dr. Wyse. Andrew looked at his watch, but stayed. I knew what I wanted and where to find it. Not more than a hundred yards from our house, along Dukes Road, there was a pile of scaffolding poles. They had been taken down a few days before, after being used in redecorating The Plaice Theatre. It was raining – it never seemed to stop raining lately – and the few people about at this late hour were at a distance in Euston Road. I figured nobody would mind me borrowing a pole – anyway, it was an emergency. I chose one about the length of the rods I had lost, and walked back, feeling more invigorated and alive than I had for a very long time. I believe I must have been smiling when I got back to the house. I was thinking that life had got boring lately and this certainly beat TV. I don’t know where I got the idea from, it had leapt ready made into my mind when Andrew had accused me of pushing the rods. I had all the necessary bits at hand. First I drilled a hole through the end of the metal pole. Through this I put a forged hook which was on the end of a length of chain I sometimes used to suspend background for photos. I had a spare screw hook, which I screwed into one of the beams in the ceiling. It didn’t take me long to locate one through the plaster. So I ended up with a large hook in the ceiling from which hung the chain over the hole. On the end of the chain was the pole. The whole operation had only taken me about twenty minutes. With legs wide, just in case – I didn’t want to fall in that hole – I pulled myself up on the chain to test it. It took my weight easily. “I’m impressed,” Andrew said. He sounded as if he meant it. “Well, here we go. Do you want to probe this time?” I said, offering him the pole. I wasn’t quite sure what he meant, but I wanted to get it over with too, so without hesitation I began to probe. With the pole it was easier to feel the hardness of the bricks. I was going down very slowly and realised I was scared of getting yanked down the hole again. I stopped and looked up at Andrew. He was watching my face. I think he felt tense too. Shifting my position I stood well away from the chain and held the pole as lightly as its weight would allow. Tentatively I pushed down. The pole was almost full length in the water now so I had to kneel. When I hit something I almost let go and fell back – but it was only nerves. Pushing the pole up and down I could feel something as hard as the brick walls. Maybe the pole had reached the bottom. Andrew came and knelt with me. Together we pushed, jerked, probed, wiggled – nothing. We did find that two of the walls did not go right to the bottom, but other than that, no result. I pulled myself up using the chain, leaving the pole almost submerged in the water. I still didn’t know what to say and stood looking at the hole, swinging the chain so the pole disturbed the water. Andrew stood watching me, in no apparent hurry to go now he had his coat on. “Why don’t you go to bed too?” he said. I started to pull the pipe up by the chain. It felt heavy that way so I let it go to kneel and grasp the pipe. Instead of the chain taking the weight of the pipe again it hung slack. I reached out to it curiously. As I touched it I felt it tighten and quiver rigidly. Andrew was half turned, moving toward the door. I screamed his name. He turned and froze, looking at me. After the scream everything was silent and motionless. Then a sound like the creaking of ships timbers came. With a rending explosion a piece of the ceiling beam was torn away, scattering plaster and dust, and smashing the water like a bomb. I saw Andrew’s face, eyes wide, lips grinning in awful shock as the noise of metal grating and rending burst up even out of the water. Then all was silence again. “Good God!” Andrew said, without apparently moving and still staring at the hole. I felt he really meant it, and I needed a similar prayer. At that moment I was convinced that if all the ceiling beams had been connected to the pole, the whole lot would have been pulled down. We left the basement pretty quick after that. In the kitchen we drank tea and ate a sandwich, neither of us saying much. Then Andrew left, promising to see me again as soon as possible. I went upstairs to our second floor flat, still with the day’s events playing over and over in my mind, but feeling complete now Andrew was part of the event. Before I climbed into bed though, I realised there was one thing I still needed to do. I went all the way down to the basement again and put as much wood and weight over the hole as I could manage. If anyone had asked me, I would have said I didn’t sleep that night. Su and I cuddled up tighter, but I was restless, and my mind clattered away, through countless replays, and unnumbered considered answers to the questions in me. But I must have slept at some point, because I dreamt that beneath all London lay a mysterious underground lake. 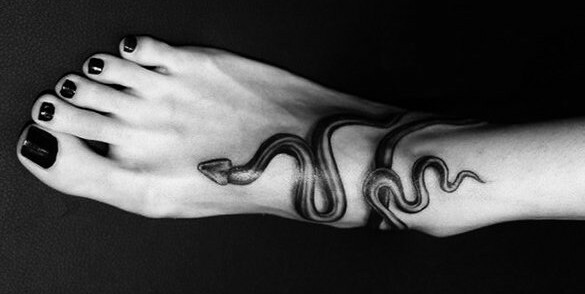 In it, as a force of evil threatening the population of the city, and perhaps the world, hid the woman and the snake. I alone knew their secret existence – and she knew I knew. The ‘lid’ was still on the hole when I collected my equipment the next morning. I had two photographic appointments out of the studio. Woman magazine had commissioned me to photograph a couple of people for illustrations in coming features. One was a motherly looking housewife who had taken up painting when her children left home, and had quickly become a best seller in the art scene. The other was Arthur Sinn, the male vocalist. Usually I enjoyed such photo sessions in people’s own homes. I found it fascinating to explore their house for backgrounds and discover what sort of person they were from their decor and the way they lived. But during these two sessions I found myself pre-occupied with images of the living eyes in a dead body, and Andrew’s face when the hook tore out of the rafter. Looking at Gladys the painter, I considered her differently than I had ever thought about anybody before. I looked at her house and her personality, examining it to see whether she had links with or experience of anything deeper than buses, cooking the evening meal, making love on the sheepskin she had in front of her open fire, and enjoying a glass of gin. I wondered if the person she was could leap the gap which existed between the excruciating conversation and atmosphere of a ‘glasses all round’ opening of a painting exhibition, and the awful power of a white serpent erupting out of her basement. I imagined telling her the events of my previous day but my fantasy came to no good end, and I repressed the desire to share my secret. Instead I wondered whether I myself could jump the gap between the person I was, to the mystery that had emerged in my basement. While photographing Arthur Sinn, these feelings deepened. I saw him as akin to a tree which had no roots, so was becoming dry, brittle and dead. Seeing him cut off from the earth and his sources of life made him appear as a body which had no person inside it. His body merely made movements and sounds which copied humanness. At one point the impression became so strong I felt I had to get away from him because of the abhorrence I felt. He must have noticed because he asked me if I were feeling okay. I excused myself by saying I wasn’t very outgoing because of a hectic day with my wife yesterday. He appeared to arrive at his own conclusions as to what I meant, and relaxed again. Riding home to Euston on the top of a double-decker bus from Arthur’s Edgware house, my troubled feelings clarified. I realised they were connected in some way with my dream. I began to sense that people were puppets, their activities and moves invisibly directed by “Things” I felt a resistance against knowing. I didn’t want there to be a man hidden in the Punch and Judy booth of life making the figures move. From the bus I saw placards displaying scantily dressed females. Using the sexual impulse thus stimulated, the unseen manipulations create a flow of our money to them. I felt the tightness of anxiety in my belly as I realised how fenced in I was — we all are — by the invisible but potent forces that direct us like unconscious cattle. I tried to imagine what would happen if I completely undressed on the bus, or walked naked down Oxford Street. In that way I was able to experience something of the enormous pressure pushing on me to conform. I realised that such influences were so subtle we may never notice how we are being led in what we buy, what we do, what we believe and who we are, until we push against them. I remembered the nurse who was murdered in the Middle East because she had tangled with one of the powers which direct human lives. Getting off the bus at St Pancras Church, and strolling down Woburn Walk to our house, I felt on more familiar territory again and my troubled vision of people subsided. I put my equipment down and considered for a moment where best to begin. “It’s not easy to explain…” I began. Su’s posture softened slightly and she said, “He rang up by the way. He wanted to assure me that you’re okay; you’re not ill or anything. He said he’s coming round about five, but he didn’t say anything about this!” She looked at the large hole in the ceiling and the hard edge came back again. “I brought him down here and. …” I paused. “And. …” I told her the basic outline of what had happened, trying to make it sound as ordinary as I could. When I had finished she didn’t say anything for a while. She appeared to be struggling with a feeling inside herself. “I was afraid it was something like that”, she said. From the look of her I thought she was going to throw the dustpan and brush at me. “Didn’t you!” she demanded. “You certainly hung that chain up didn’t you? I felt something like this was going to happen right from the first.” She looked at me angrily, then suddenly walked out and banged the door shut behind her. After a moment’s pause I ran out and called her, but heard the front door slam. I was half way along the passage trying to catch up with her before I realised she might want to be alone. Anyway, I needed to process the films I had taken to make sure the sessions were usable. Andrew looked very pleased with himself when he arrived, but he became more subdued when he saw the situation between Su and me. I explained that Su was upset because of what had happened the night before. Su arrived with the coffee. “You mean you’ve found an explanation?” she asked, her sharpness apparently melting. “Is there a line under the house?” Su asked. “So we can tick that off as a no,” I said. “I think so. After that I had no clear direction I could follow. What else would generate enough power to tear your ceiling out for instance. So I decided to try another approach. I phoned the Daily Telegraph library and asked if they had any reports on unusual events in cellars. “Are you saying you hit a blank there too?” Su asked. Andrew put his notebook back in his pocket and drank his coffee. “It’s not my job or my intent to form opinions as to whether someone is crazy or sane, good or bad. That sort of value judgement is of no use in understanding why or how something happens to a person, and whether they can be helped. How would it help if I stuck a label on you saying ‘Bob is crazy’ or if I put a notice on your studio door saying ‘what happens in here is bad”? “Andrew, if you had kept quiet about your suspicions, perhaps I wouldn’t have told you this, but today I had very strange feeling about people, and what goes on under the surface of their life. Maybe that was why I said what I did about being the crazy one.” I proceeded to describe how I had felt when photographing Gladys and Arthur Sinn, and my thoughts about the murdered nurse. As I spoke he took his notebook out again and started writing hurriedly. I was also aware of Su gradually getting more agitated. By the time I got to mention my fear that powerful forces were invisibly at work in peoples’ lives, she could hold back no longer, and almost flung words at us like projectiles. I started to say, “I thought that….” but she cut me off. She waited for us to reply. We didn’t, so she carried on. “I don’t know if what you described is psychological or mechanical, and I don’t care. If something needs to be done about it, let somebody else do it – the fire brigade or the health officer. If nothing can be done, cover it up and leave it alone.” There were traces of tears in her eyes, but she wiped them away energetically and looked at us as if challenging us to a fight. The days that followed were difficult. Confronted by Su’s pain, I think Andrew and I both felt deflated, and could see some of the excited sense of adventure we had unconsciously invested in our plans. Su had sensed it and hit it for six. At night in bed, Su was distant and unmoving. Usually we enjoyed the warmth and pleasure of holding and touching as we slept. Now, even her feet avoided mine in the sheets. It was as if she were surrounded by invisible but potent ‘keep off’ signs. Well, I kept off but I resented being emotionally battered into conformity. Explaining how she felt would have been enough I think, but I felt like someone in a cage, being poked through the bars and restrained from poking back. Part of me badly wanted to find out what was down the hole. Despite Andrew’s assurances and Su’s threat I couldn’t completely believe in my own sanity again without an explanation of what had happened. I didn’t really understand Andrew’s idea of social epidemics, and how I fitted into it. I repaired the hole in the ceiling and put the new floorboards down. I needed to because I had a few studio sessions to do. People don’t mind an untidy studio if it functions well, but not gaping holes. Despite difficult times though, I could not make myself board up the scene of my experience forever. I made a hinged trap door over the hole. I made it as flush and firm as I could, and covered it with a rug. There were signs of improvement in the communications system between Su and myself, and I had no wish to undermine that; yet for the sake of my own need to understand myself, the trapdoor was necessary. It is so easy to understand things looking back. There was a spell of fine, dry weather as we moved toward spring. Nearly three weeks had passed since the conflict with Su. The ‘keep off’ signs had gone, and we were meshing well together again. Andrew was still working on his theory, but not in an intrusive way. At our last meeting he had said there was possibly a long term repressed national shock similar to Su’s repressed pain in con­nection with her father. Nations, he said, have to work out such shocks as they are involved in wider opportunity, just as Su would have to face her shock if I were to claim my independence. I’m not sure I really see evidence of what he is saying, but he promises that it will be clearer if he can gather more evidence. Then, while enlarging photographs of a local publican’s baby, I noticed a difference in the sound of the room. Having dim lights for processing makes one more aware of what one hears, and the feel of the room. The studio felt less solid and had a hollow sound, like a room which has had all the furniture removed. I realised, in fact, that my walking across the floor was the source of the hollow sound. As a child I had lived in a house in hilly countryside. Across a small valley and opposite us was a partly wooded hill. The trees covered what had been a quarry dug into the hillside. In summer, even on a radiantly hot day, the trees kept the quarry shady and cool so that bird song in the trees reached us amplified, as if from a cool, liquid world. Therefore, in the warm dimness of the studio I recognised the hollow sound as reflecting from a pocket of colder air somewhere. So, when my prints were in the fixer I switched the main light on, removed the rug, and opened the trapdoor. The water had gone! For some moments I was seized by excitement. Strangely I felt I had found something precious to me. Yet all I could see was the mud covered bricks of the square hole leading into darkness. Hurriedly I switched on one of my studio lights and shone it down the pit. I don’t know if I expected to see an answer to my questions displayed at the bottom. There was only an uneven rocky floor covered with fine silt like the bricks. A ragged hole crossed the bottom of the brickwork. There was no sign of rods, pole or chain, but I could see powerful gouge marks going down the bricks, presumably where the pole had been forced, for it would never have entered the tunnel unbent. I must have lain on the floor looking down the pit for many minutes lost in thought and suffused excitement. During that period I realised the now obvious connection between the dry weather and the water disappearing. I understood that the tunnel at the bottom was most likely an underground river course. There were lots in London, but most of them were piped beneath the streets and houses. Much else was also understandable now. The winter had been particularly wet. So much rain had fallen, the Thames had twice risen above the protection height of the embankment. The water level in the underground sewers and rivers of London must have reached unusual heights too. Bloomsbury was quite a way above the Thames, beginning the rise of land towards the hills of Hampstead. The tunnel was most likely empty of water usually, and therefore the brick hole could have remained full of earth for years. With the flowing water, and my poking about, the plug had been removed. It seemed amazing to me how time and the cycles of nature worked together to hide and then reveal in this way; and how my own life was woven into the event. I realised why I was excited.. The uncertainties I had suffered about myself had caused a yearning in me for understanding. When I had looked into the empty hole, the pieces of information were already rushing together to form the realisation described. But I stood up, with the elation disappearing. The snake, the woman and the pole were still not explained. There were still, figuratively speaking, waters which must recede further to reveal what I needed to discover. I decided I must look into the tunnel. I got my leg up out of the hole and put the torch down. Su was out till the evening. There was no way I could tell her. Anyway, was I some sort of schoolboy who had to get her permission for everything I did? No – that was simply how I felt. Su was frightened of getting hurt again, she didn’t want me to be a pet schoolboy. Perhaps if I telephoned Andrew he would come over. His good sense might make it clearer whether I should go down the hole or not. If I waited for Su to come back she was bound to say no anyway. If Andrew went down, I would at least have the excuse that he needed a partner. I rang his home number. An answering machine said that if I would leave a message, it would be passed to him as soon as possible. I swore at my luck, but said to the machine that I’d had a breakthrough in the basement saga. Come as soon as possible. I told him about the water having gone, and my ideas about why. “You’re not thinking of going down are you?” he asked, as if the idea had suddenly hit him. When I went into the studio I locked the door in case Su got back before I had closed the trap. I walked to the spotlight, still pointing down the hole, to remove it. Doing so I realised I still had an argument going on inside myself. Despite what Su and Andrew had said I still wanted to have one quick look along that tunnel. In my mind I went through my conversation with Andrew again, and decided I had better wait. But there was no harm in just looking down the hole once more before closing the trapdoor. I switched the light on. There was a flash of movement. Something alive had jumped back into the tunnel. It was so unexpected I had not really seen what it was. But it was an animal, perhaps even a human. Either a large animal or a small person. I grabbed the torch from where I had left it and quickly, but with as little noise as I could manage, went down the steps. When the creature had disappeared from sight I had heard only a short period of scuffling flight, so perhaps it was hiding where I could still see it. Whatever it was had gone along the tunnel behind the steps, so I had to squeeze past them. The tunnel was about four feet high and regularly shaped. By the light of the torch I could see that after about twenty feet it slanted slowly to the right. There was no creature and no visible hiding place. Switching off my torch, crouched and feeling my way carefully, I slowly moved to the bend. I listened for a while but could hear nothing except my own breathing. Pointing the torch at where I hoped would be the direction of the tunnel, I switched it on. There was a small cry, then the sound of movement, but I couldn’t see from what. I was unprepared for the size of the area in front of me. It was a long cave, still only four or five feet high, but very wide. Frantically searching with my torch at last I found the creature. With a shock, as if I had pinioned it with my torch, it stopped, then faced me, about fifty feet away. I cried out, without meaning to, for it was a child. All in one sound I wanted to tell it I was human, stop it from running, and communicate that I meant no harm. What came out was a loud “Hey!” The child turned and ran, perhaps all the better for the light of my torch. I thought it was a boy, about seven, but the uncut hair and mud spattered body and face made it difficult to tell. He was clothed, but again the mud made it impossible to see in what. As well as I could, I ran after him, shouting “Don’t go, it’s all right… stop.” But my headlong chase came to a sudden halt when my head hit a projecting piece of the roof. Fortunately it was rounded; but I dropped the torch and had to sit and swear and hold my swelling head for a while. When I again became aware of other things than pain and anger, I thought that at least the child would not be able to run in the dark. But I could hear him moving purposefully away. Eventually I found my torch again by feeling in wider circles around where I sat. It had gone off when I dropped it, but by shaking it I managed to make it work again. In its light I could see that the boy was now not the only one grimy with mud. In looking at my legs and shoes I also accidentally saw how I could follow the child. My fall had left its story in the silt. Turning my torch backwards to where I had come from, I could see my footprints. So surely the boy couldn’t help but leave tracks. They were easy to find, but there were two sets. One leading to the hole under the Studio, and the other heading away. I followed these. At the end of the cave the only outlet was a narrow corridor or passage. I had to walk through sideways and at an angle because it sloped. At one point my feet were off the ground and I had to move crab-like from projection to ridge until I found the floor again. I looked down once, but I couldn’t see the bottom so I gave up trying. I didn’t think I was nervous, but I noticed when I stood on firm ground again I sighed heavily a number of times as if I had been holding my breath. After that the corridor widened, and was high – about fifteen feet. It was still very irregular, but I could walk upright now. The tracks were still clear. They were the only marks on the ground. I couldn’t see the boy though because the corridor twisted and turned. At one point I had to wade through quite a deep pool of water. Fortunately it was clear. Just after that I walked for about a hundred yards before realising I was following only one set of tracks – the ones pointing back the way I had come. I was sure I hadn’t passed the child. I hurried back, and just my side of the pool the second set of tracks finished. I searched around for yards, but could find nothing; until my own tracks obscured any clues. Switching my torch off I listened. Nothing, except an occasional drop of water. While listening I remembered playing hide and seek with my friend Eddie, around Cleopatra’s Needle. It was a most unlikely place to play the game as everywhere was so exposed. Yet when it was my turn to hide he couldn’t find me. The reason being that I had climbed up the steps of the column until I was above his head height. He had looked everywhere, scanned the horizon, but had never looked up. Standing where the footprints ended I pointed my torch upwards. No boy to be seen. Then I noticed that what I thought was a shadow low down behind bulging rock, was an opening. Crouching, I could manage to get my head into it but the rest of me wouldn’t follow. In that uncomfortable position I managed to get my hand in too, and shine the torch upwards. Four feet above me, in a tiny cave at the top of the shaft, the boy crouched, peering down at me. He held a rather battered torch in one hand but no light came from it, and he reminded me of a treed wildcat because it looked as if he was ready to hit me with the torch if I managed to get any closer. I couldn’t. Even my extended arm would not have reached him. He replied “No.” His voice was completely emotionless and flat. It was almost as if he hadn’t spoken. “Can I get you some batteries for your torch?” I tried. After several more “No’s” I asked him his name; what he was doing in the tunnel; where he lived; weren’t his parents worried. He was silent. I glanced at my watch. It showed half past eight. “Oh, bloody hell,” I said. “What?” responded the small voice. He didn’t reply. Poking my head in the hole I had one last look at him. He was squatting, hunched up with his head on his knees. There appeared to be a small tear rolling from his left eye and he was sucking his fingers. I ached inside, but I had to go. My torch battery had gone completely by the time I got back. I had to feel my way along the last part of the tunnel. As I neared home though, the glow from the studio light shining into the pit began to penetrate the darkness. Climbing the ladder was exactly like leaving one world and entering another. Colours in the studio burst in upon me like waves of joy. I had an urge to send several of my friends down the tunnel for a few hours just for the pleasure of emerging into such a big, comfortable, noisy world. The kitchen door opened and mum stepped out, still in her shop coat. I’d forgotten how muddy I was. Feeling my way back in the dark had covered me and I saw later that a streak of blood had dried on my face from where I banged my head. “Listen to me.’ It was like a circus in that shop.” He took his feet off the chair and pointed at the shop. “She came in with her bags packed, sobbing right in the middle of the delivery men bringing in half a ton of potatoes. Then she starts saying how she’s going and not coming back. I tell you it was like a circus. There were so many people standing around with their mouths open watching, we could have sold tickets for seats.” He sighed, shook his head, and looked at his paper again. “Anyway, she’s gone,” he mumbled, to his paper. Dad loved Su. I don’t think he had ever been as close to someone with Su’s girlish femininity and softness, yet who also had the strength to argue back at him when he got excited. Also, my being their only child meant he never had a daughter. Mum was sitting with a cup of tea and a cigarette both in the same hand. When she put the cup to her mouth she had to squint because of the smoke. She looked like she’d been crying but I couldn’t tell whether that was because of the smoke or Su. Dad’s apparent apathetic communion with the paper suddenly disappeared. He threw the paper down and stood up, glaring at me. “A child.’ That bloody does it’. First you come up with the story about a woman and now it’s a bleedin’ child.” He strode into the shop shutting the door noisily behind him. “Why did you say that to him and upset him?” Mum said, squinting at me through the smoke again. The apartment Rosemary rents is on the second and third floor of a house in Cheyne Walk, overlooking the Thames Embankment. She is one of those people who have everything – even to a small library and telephone in her toilet; and of course, an electrically warmed toilet seat. I could understand that Su had wanted to stay with Rosemary – her apartment is so warm and soft edged – it makes the noises of life seem far away. I purposely didn’t telephone beforehand. Rosemary is a businesswoman, a redhead, and an unadmitted feminist hiding within a soft face and lacy cuffs. She had no children of her own, so she might be as protective of Su as an irate mother defending her injured child. Rosemary had one of those ‘speak to gain admittance’ gadgets on her front door. It was so much easier to keep somebody locked out if you weren’t facing them eye to eye with the door already open. I pressed the bell……No response. I pressed it again, standing well into the door so I couldn’t be seen out of a window. A crackly “Hello” greeted me. “After what has happened do you think you have any right to?” she asked. Rosemary’s microphone was nice and high, I could tell. I relaxed. This was it. I couldn’t help a chuckle as I said, “I bet you would, but having said what I came to say I’m going. You know where to find me.” I didn’t move, but waited for Su’s anger to take her where I had hoped. Rosemary has an inbuilt aversion for any form of authority except her own. She looks upon other people such as policemen and school-teachers as if they were youngsters playing a game she is too mature to believe in, but needs to be tolerated. Strangely enough, at times of national stress or with foreigners, I have seen her defend criticised policemen. She almost hit one irate Frenchman with her umbrella because he called London bobbies imbeciles. Anyway, she had sided with the boy against his persecutors. Her reaction had made it much easier to tell my story and build a sense of unity with Su again. Therefore, between us we worked out a plan of action. The following day was Saturday. Rosemary would be working at her Boudoir Boutique. It was only a hobby for her as she had more than enough income. Her husband earned a satisfying amount as a foreign diplomat. His being away seemed to suit Rosemary as I never heard her complain, but it left her with time to play. Like so many people with money, her hobby turned out to be a commercial success too. It was Su’s work as a designer which had led them to meet. Saturday business would also keep Mum and Dad out of our hair. I felt a momentary twinge of resentment. I decided not to allow it space in my life. Perhaps, after all, I had not been the only schemer. So what, I was happy. I accepted Rosemary’s offer. The bedroom was like a soothing, warm cloud. The depth of the carpet, the colour and the heated bed enticed my weary flesh to relaxed pleasure. When Su slid into beside me and the tight softness of her skin pressed against me, I let my pleasure grow until it excited and penetrated hers. It was a lovely night. It didn’t take us long to check our list of necessary equipment. We had bought batteries and a new torch for Su. Sandwiches had been made, and a hunk of home-made cake packed in a small knapsack. Two helmets we got from a local tool hire service. Wet-suit leggings were borrowed from Rosemary. Her husband was a keen skin-diver, and some of his gear was old and wouldn’t matter if it were scraped on rocks. I had sticks of chalk and a compass in my pocket, and I had wound rope round my waist to cope with the unexpected. Lastly, the overalls we already had from our efforts at DIY flat decorating. “Oh, we had better ring Rosemary,” I said, as I struggled to get my knapsack on. I felt an excited pleasure that Su was coming with me. I tried to kiss her before we started, but our helmets banged and we couldn’t make contact. This time I had a definite sense of transition from one world into another. It was the same feeling I often had when swimming in the sea, especially if I had a snorkel and goggles on. It was a feeling of being on the edge of a vast and unfamiliar element, whose depths were full of unknowns. Su’s quietness and cautious movements told me she was sharing a similar reaction. It didn’t matter that the child had gone. The tracks in the mud were still clear. Continuing on from the shaft, beyond where my bigger tracks stopped, was the second set of the boy’s. From here on it was new territory for both of us. My compass indicated we were moving roughly south, but I had no idea where we were in connection with the surface. As we moved further along the winding tunnel I began to understand what Su had meant about the boy’s fear. The tunnel stretched on and on – up and down, crawling and standing. A sense of oppression settled on me which was not easy to combat. Su was trying to make bright conversation, but I found it difficult to respond. The realisation of the unthinkable weight of earth above us pressed on my emotions. At one point we heard a train approaching. It came closer and closer, and irrationally we both reacted as if it were coming along the tunnel we were in. Then it passed us quite near by. Knowing it must be the line to Russell Square didn’t help. It was one of the deepest stations in London. I only hoped we were above it rather than below. Both of us were perspiring and needed the rest. Su undid the rucksack while it was still on my back. It would have been difficult to take it off in the confined space. My mouth started watering as I smelt the food. We sat as near to each other as we could. The sandwiches tasted like the first food I had eaten for a week. “Hey” Su said, so suddenly I jumped. “Well, as we were talking I realised one side of my face is colder than the other. It’s where I’ve bean perspiring-, but why aren’t both sides cold? It was true. The right side of my face was colder than the left. “I’ve got a lighter in my pocket here somewhere” I said. “Fold the bag the sandwiches were in and I’ll light it to see if the smoke shows a draught.” It did – quite a strong one blowing in the direction we had come from. Still with the paper smouldering I crawled forward. After about twenty five yards the roof got higher and we could stand up. Walking slowly forward we came to a spot where the draught stopped. The footprints seemed to go straight on, but for some reason they drew to the right hand wall. Holding the almost burnt out paper higher, it suddenly flared up again. “There’s a hole up the wall,” Su shouted excitedly. Suddenly our decision to quit was lost in the new discovery. I scrambled up easily. The hole was jagged, but wide enough to crawl through. As I started to cautiously look through, I realised with a start what I had my hand on. “How can a hole be made of bricks?” she said. “What’s on the other side?” Su said, tugging at my ankle that was dis­locating my none too firmly placed foot. The hole was just above the floor level of the new tunnel, which was roughly six feet square. We both scrambled through and stood up, feeling safer because there were bricks around us instead of cave walls. The water in our first tunnel had obviously eroded the bricks and burst through into this one. Although it was man made, it was obviously unused. The small gauge track was rusty and now silted from the water. “Who’s the cheery one now?” I asked. There were footprints in both directions, but we chose to continue south. We hadn’t walked far when I felt sure I could hear sounds in the distance. Su was talking. “Stop talking” I said. “I’m sure I can hear noises along the tunnel.” Both of us could hear what might be music. It was difficult to tell. “What d’you mean, they?” Su asked. Walking along with our torches out, we soon realised there was a glow of light ahead. Soon the sound and the light grew. We couldn’t yet see the source of either because they appeared to come through a doorway on the left of the tunnel wall. As we neared the door, something suddenly tugged at our legs, then stopped. Ahead something boomed. It sounded like a huge gong. We walked up to the door and looked in. “Good grief, what is this place?” Su whispered. “Hell only knows,” I said. Through the door was a huge area maybe a hundred feet square. It had most likely been used for storage at one time, with raised areas for loading and a many arched roof supported by columns. Now it was filled with a mass of objects and colours, I couldn’t comprehend immediately. Strung in no apparent order, but in a way that delighted the eye, were bulbs of different hues, on wires that must have come from building sites. There were Christmas lights on artificial Christmas trees. Music poured indiscriminately from several radios hidden from view by furniture and objects of the most amazing variety. Here and there real shrubs, flowers and trailing plants added green life. In one area, tailors window dummies – male and female – stood dressed in the strangest assortment of clothes. From the ceiling, disappearing into the arches, hung lampshades and chandeliers of every description; none in perfect order. Several stuffed crocodiles swung amongst them – perhaps they stared hungrily at the taxidermic delights below. There were birds nesting in the shrubs, squirrels climbing columns, even a whole tiger growling at a china dog. People were obvious by their absence; but I couldn’t help feeling hidden eyes were watching us. Out of the corner of my eye I saw something moving stealthily toward us from the darkness of the tunnel. When I turned to directly look, I screamed. Prom the blackness was emerging something straight out of my childhood nightmares. It was a gorilla with black legs, blue chest and red arms, with an almost human face. Su screamed as the thing charged. I pushed her through the door and tried to follow, but it had me. I heard Su scream again as I was kicking and writhing. With a roar of what sounded like pleasure, the monster lifted me onto it’s head and carried me, still struggling, through the doorway. Once there, it ran to a column and, dangling me by a leg from one hand, it began to climb; I couldn’t see where to – everything was upside down. It dropped me – literally. I fell several feet into a large Victorian pram. With the helmet and the amount of clothes I was wearing, I wasn’t injured, and lay with my legs dangling out one end and my helmeted head the other. Before I could say anything the woman called out, “Mummy’s coming, darling. Don’t be afraid,” and pushed the pram faster. I didn’t reply because we arrived at where Su was being held down. I had never met with a situation like this before in my life, and was confused about how to respond. Su, looking somewhat like an alien in her green wellies, orange overalls and yellow helmet, was being held in the middle of a startling flowered carpet, by three startling people. Sitting on one of her arms was a dwarf dressed in running shoes, short pink socks, jeans cut off above the knee, a sweater which must nave been knitted out of odd pieces of wool of many colours, and a top hat. I’m sure he was only three feet high, but the hat made him appear taller. Holding her legs was a very thin man whose eyes and expression constantly shifted. I thought at first he had a twitch, but this was only an appearance given by the almost abrupt changes of his face. Grasping her other hand was a youngish woman with a dreamy expression. She didn’t appear to be holding Su down, but abstractedly stroked her hand. Also, the creature who carried me off arrived just as we did and squatted at a little distance, watching. I tried again to escape from my pram, and was again pushed back by my nursemaid. The boy’s eyes warned me to keep still and let him handle it. The woman sat on me so I kept still. Looking at the boy, the dwarf said “look what we caught, I. Q. It’s an invader.” He rubbed his hands with glee and looked at Su again. “An invader” the thin man echoed, looking pleased with himself. “She’s looking for a boy,” the thin man said, his face jerking into an expression of concern as he looked at the dwarf. Pill got up, threw his top hat on the floor and kicked it furiously. He picked it up and turned to the boy. “You’re always spoiling things, IQ,” he said, banging his hat with one hand as if it were IQ himself. So much had happened so quickly, I felt dazed. From what seemed like hours in the tunnels, we had been catapulted into a crazy whirl of events. I could see that Su, who was still sitting, felt the same way. I began to climb out of the pram, hampered by the knapsack I still had on, and noticed as I did so that my original captor, Lucy, had moved close to Su, and was looking at her with his deeply soulful eyes, but as little expression as an orang-utang. Almost offhandedly he reached out and felt her left breast, as if testing to see if it were real or what it was made of. Su had been looking at me and had not seen him approach. “Hey” she said, “keep off,” and tried to slap his hand. He was too quick and moved back out of range, still bland faced. “Lucy, don’t touch,” IQ said, without any malice in his voice. “He’s curious to find out whether you’re a girl or not,” he said to Su. “Well, I am,” she said, getting up off the floor and taking her helmet off, letting her hair fail loose. “What do we do now?” she asked me. We explained to IQ that I had been worried about him. I imagined him living alone in a dark and damp tunnel somewhere. I had no idea how he got food, and when I had left him he looked cold, damp and miserable. “So what’s going to be done now we are here?” Su asked. The young woman who had been holding Su’s hand was now standing next to me, holding my arm. “Maybe we’ll have to keep you here,” she said, gazing into my eyes with a mischievous look. “You might show the police where we are if we didn’t,” she added. Nerk was looking from speaker to speaker, his face twitching with the conflict of whether we should stay or go. When IQ said, “We’ll have to trust you then,” Nerk echoed, “we’ll trust you then” and his face found peace in a smile showing corroded teeth. “Okay, but first we’ve brought you some cake,” Su said, undoing the knapsack. It had withstood the journey and the pram quite well, and was big enough for everyone to have a slice. Lucy came forward and held out both his hands. His colouring, which had so disturbed me in the beginning, I could see was rubbed on. But he did look as if one of his parents had been a gorilla. Pill and Mother turned up as if they smelt the cake. When he had his slice, Pill offered me an aspirin. He chewed one himself with his cake. When I refused he fished in his pocket and pulled out a packet of throat pastilles. I took the one he offered to show I had no hard feelings. He had a rather worn bandage wrapped around his shoe, and was limping theatrically. The tour was worth the climb through the tunnels and the shock of our reception. As we explored the place I began to feel that these people were really creative in a disorderly sort of way. I would love to have been able to use some of the settings as photographic backgrounds. IQ began to appear in a new light; no longer a deprived, lonely child, but one living in a richly stimulating environment with hardly any of the barriers of a normal boy’s life. If an entrance fee had been charged, and ‘Outsiders’ allowed to come in, the strange little group could have been rich on the proceeds. Amidst the seeming jumble of objects were many different places or scenes. In one was an oversized Wendy house made out of odd pieces of wood. Inside reminded me of an old log cabin, with its simple wooden furniture. Elsewhere was a bedroom which give the impression of walking into a mist. There were so many chiffon drapes and soft things around. Apparently, Angie, the woman still holding onto my arm had made it. The walls were of different materials stretched on frames, and the ceiling was an old silk parachute suspended from the roof. Each of them had made areas of their own. There were fun places such as the tailors dummies which had clothes and fancy dress of all types, and was obviously used often; or there were quieter areas such as the wall of books or the sick quarters. There was even a workplace with all manner of tools, and also a bathroom. This was a plumbers nightmare – or delight – a mass of tangled pipes with a waterfall cascading down, various sinks, toilet bowls, urinals and fish tanks. Some of the sinks functioned, and hot water came up from a tank. Gradually we learnt from whoever happened to be telling us about what we were looking at, how the place worked. The electricity came from a connection they had made with the London Transport electricity supply. Nerk, when he wasn’t echoing what everybody else was saying, had a passion for electricity. The furniture, clothes and mass of other objects had been collected over many years. They told us that almost anything can be found in dustbins and tips, if you know where to look, and are patient. At night they go to the surface through escape hatches they know and hunt for food and pickings. Nearly everything was used, they said, but occasionally they found new things that people had misplaced. And in some of the markets, food was left just ‘lying’ about. Looking at my watch I suddenly realised it was time we left. We had an hour and a half to get back before we needed to phone Rosemary. The surface world and its needs seemed far away, but I knew we must remember it and get back. As we started, Mother, Pill, Angie and Nerk came to the tunnel door to see us off, and Lucy and IQ insisted on coming. with us. IQ put the new batteries we had brought into his torch and we set off. I suppose because we knew the way, and there were no unexpected’s to meet, the journey seemed quicker. Lucy followed Su like a devoted dog. He actually growled when I got near her. IQ chattered to us. He said there were others who lived in the tunnels we hadn’t met. Some moved around a lot, or preferred to live alone. Because of his uncouth appearance and habits, Lucy had been a virtual prisoner in a psychiatric hospital. His name, Lucy – from loose in the head – had originated there. I could understand why. Watching him following Su he looked like a prehistoric man, ancient enough to be almost pre-verbal. Considering that people in England felt it anti-social to breast feed a baby in public, anything as basic as Lucy roaming free would cause most people to call the police. For Lucy, the underground world gave a life of freedom and normality. At one point I was last in line and noticed Lucy several times pause and sniff the air and the ground. “What’s he doing?” I asked IQ. The creature rocked his body and paced back and forth a few steps. ……. Big….” he said. “Somethin’ ‘as been through ‘ere which makes ‘im restless,” IQ said. Su, who was in the lead, said, “maybe he’s right. You probably can’t see it back there because we’ve all walked along this tunnel, but up ahead of us it looks as if something has wiped out our tracks.” She looked at Lucy who was still rocking. “That’s good, Lucy, to tell us that.” He stopped rocking and squatted nearer to her. “Maybe we ought to talk to O’Jesus fairly soon” Su said. “Okay,” I said, “but meanwhile let’s get home as quick as we can.” I took Su’s hand, as the tunnel was wide and we didn’t have far to go now; but was suddenly knocked over. As soon as I had touched Su’s hand, Lucy had leapt forward and pushed me aside. Now he stood apparently guarding her. “Lucy,” Su shouted, “you mustn’t do that. He’s my husband.” Lucy didn’t appear to be convinced. “Can’t you tell him?” I said, watching Lucy cautiously in the torchlight. I felt like walking on and forgetting the incident. Having already been half way dragged up a column by Lucy, I didn’t want to repeat the scene in a tunnel with a six-foot ceiling. I realised though that if I didn’t meet Lucy with even a token strength now, I would forever be in fear of him. Grimed in mud the way he now was, he looked completely the part of a cave man. My heart pounded as my body got ready for a fight, and burning in my chest, almost stopping me breathing, was fear. Lucy reacted to the obvious tension between us by crouching slightly, and shifting his weight, getting ready for battle. Seeing this, my fear reached a pitch where I thought for a moment I was either going to be paralysed by it or I would turn and run. Then something I had never experienced before overcame me. A violent trembling began in my legs and engulfed my body. When it reached my neck I felt it as if a wave which would swallow me if I relaxed. My neck was my last stronghold, but I couldn’t hold out, and as the wave shook my head a roar uttered from my throat. It felt wonderfully powerful. The shaking had dislodged the tension and fear. In its place was a sense of tremendous tingling. My body seemed more fully alive than before, and I was aware of Lucy, Su and IQ in a different way. An animal part of me, asleep all my life, had been awoken by Lucy’s challenge. Through its eyes, I could see IQ as a young male cub who gave no challenge, but who was watching with keen interest how men did business. Su appeared to be two people. One was a rather fragile thing that was her civilised, educated personality. This part of her I could see was anxious, and afraid of my roar. The other part of her was a healthy female, feeling pleasure in my challenge and understanding the strength of it. Lucy roared back. A few minutes beforehand I would have felt frightened that I was facing a crazy and enraged man who was like a beast. Now I felt his noise not as an attack or a threat, but only an expression of his strength. The wave of trembling had transported me to a new world in which everything appeared different. The mind and emotions of the people around me was some­thing I shared to the point of knowing what they were feeling. The sense of sharing IQ’s youthful growth, and Lucy’s powerful expression of his most basic feelings filled me with pleasure. I laughed aloud and knew my companions shared the happy feeling with me. Walking toward Lucy I took his semi-crouched posture and put my forehead to his. Without aggression, I let the strength in me push against him until we balanced each other. An experience of kinship flowered in my chest and I felt certainty that Lucy knew the same feeling. His great right hand lifted and rested on my shoulder. Slowly moving apart I went to Su and put my arm around her, looking at Lucy. He made no move to protect her. The sleeping animal in me had awoken and by speaking in the language Lucy understood, told him Su was my mate. Through it I had entered Lucy’s world. It was a way of experiencing people I had never suspected. A way in which through emotions and move­ments, a communicating took place that was like sharing minds. Lucy and IQ appeared to be at home in that form of communication, but Su was almost completely unaware of what was occurring. When we crawled forward the light from the studio soon came in sight. As I climbed up the steps behind Su it felt as if we had been away from the familiarity of home for years. Clambering out of the hole was akin to emerging from an ancient world. Seeing the faces of Rosemary and Andrew, for long moments I had no understanding of who they were. I saw them still through the eyes of my awoken animal self. In Rosemary I glimpsed her struggle to find equal opportunity with males. I saw her body as slightly male, suppressing her woman-ness. Andrew looked like a great mind that was drawing strength from his physical functions. Then, suddenly my mind clicked over into its usual view of the world. I was home. When I stood to my feet in the studio, Lucy’s head and shoulders appeared above the floor behind me. He growled low in his chest when he saw strangers. Andrew simple exclaimed “God!” and Rosemary dropped the cup of tea she was holding. When I looked back at the hole, Lucy had gone. I looked down the pit. It was empty and silent. “Through the door was a huge area maybe a hundred feet square. It had most likely been used for storage at one time, with raised areas for loading and a many arched roof supported by columns”. It was at that point that I lost my energy being in one point and I could only regain that focus again when we were back in the tunnel again. I did not leave the tunnel yet and I will explore it in my dream tonight to see what I have hidden there. P.S. I do believe the story is worth it to be finished. Anna – So do I wish to finish the story. Maybe when I finish dream dictionary.